The GenuTrain A3 from Bauerfeind supports the knee by providing controlled compression throughout the joint, while relieving pressure over the patella. GenuTrain A3 centers the patella during joint movement and stimulates the skin receptors and nerve endings in the muscle-tendon transition around the knee to enhance proprioception and decrease pain and swelling. The newly developed insert encompasses typical pain areas and important receptor zones of the knee joint. The patella corrective guide is imbedded in the insert zone. Two spiral stays located on the sides retain the shape of the knit. A stretch zone in the lower leg area facilitates application and removal. In addition, the viscoelastic insert has friction zones that are covered with massaging nodules. A breathable, anatomical knit is very comfortable to wear. A special, non-irritative weave is incorporated in the critical area behind the knee. 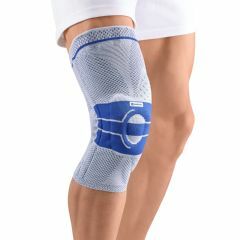 Available Sizes: Loosely measure, as follows: Point 1 - the circumference at 4 3/4" below the center of the knee; and Point 2 - the circumference at 5 1/2" above the center of the knee.